FIRST-YEAR Adelaide coach Matthew Clarke is preaching versatility to his players as he keeps his options open on how to fill key roles in his new-look AFLW side. Clarke is starting with a clean slate in his first senior coaching role after inaugural Crows women's coach Bec Goddard departed at the end of last season due to work commitments. With a wealth of knowledge to draw on from more than 25 years involved in the AFL as both a player and assistant coach, Clarke is eager to give his players the opportunity to show where on the ground they are best suited before locking them into specific roles. Clarke gets a chance to have a look at his players in his side's trial game against Fremantle in Darwin on Saturday night. 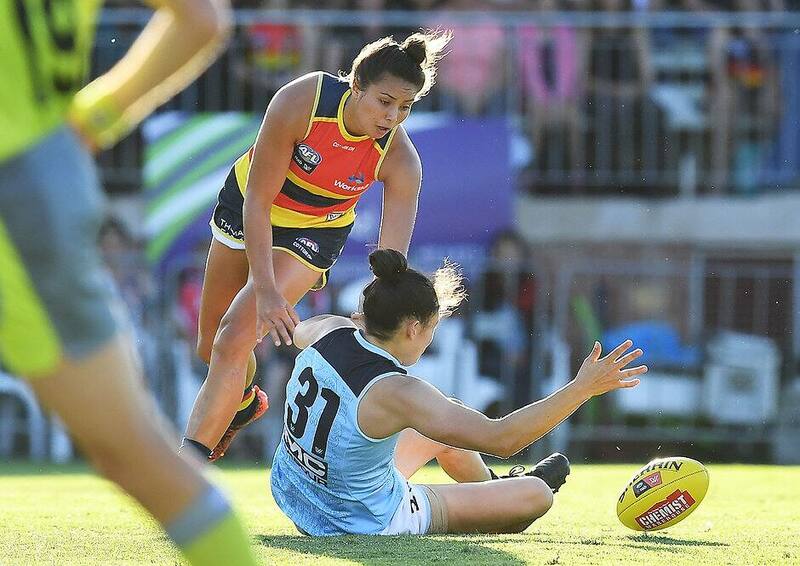 One of the areas the Crows will need to bolster is their attack, with last season's joint leading goalkicker Ruth Wallace sitting out 2019 for personal reasons. "Obviously that means our forward half is diminished. But one of the things we've been mindful of doing is not pigeon-holing anyone into a particular position … it's probably a bit soon to do that," Clarke told AFL.com.au. "From a coaching perspective, it makes sure we're not missing out on something that's sitting right underneath our noses. "Who replaces Ruth? We don't know yet, but someone will," he said. Youngster Eloise Jones is among those who could play a more prominent role, having made a promising introduction to the elite level as a forward last season. "She's got high-end talent, but she was in her first year and young, and she's physically a bit stronger and a bit better this year," Clarke said. "But equally, we're keen to make sure we expose her to some midfield time and even across the backline, because those skills can be really useful at the other end of the ground, too." DRAFT WRAP Who did your club pick? Jones will miss the trial game with a groin injury, while defender Courtney Cramey (hamstring) and Jessica Sedunary (foot) are also sidelined. Sarah Perkins is likely to start deep in attack for the Crows, having played that role for Hawthorn in the VFLW last season. Perkins was one of the stars for the Crows during their premiership-winning season in 2017, but failed to have the same success last year. She was even used in the midfield at times to get her into the play. "She is a forward, but once again, I want to see what she can do in some other spots," Clarke said. "Through the pre-season, we'll make sure she has a look at back and mid because ultimately, if you've only got one spot and it's not working for you, it can be really challenging. "We'll make sure there's another option for everybody."